If you own or are thinking of buying a DJI Phantom 2 quadcopter, you are going to need a case of some sort for transporting it to your flying destinations. Then HPRC came to the rescue (video review below) with the HPRC 2700WPHA2 Hard Case. I would not recommend simply using the backseat, or the passenger seat of your car to lug the Phantom 2 around. At some point, you are going to damage it for sure. When I knew I was going to buy the Phantom 2, I started thinking about accessories and the case was at the forefront of my mind. I saw a couple of DJI Phantom 2 kits where a case was included but they seemed small and some needed the props removing before packing away. I have to admit here that HPRC sent me this case to review for All Things Photography. It is rare that I get free products to review as I mostly tend to review products that I buy. Or, if I like them and think viewers will too, but in this case I accepted. After seeing the images sent to me by HPRC, I knew this case would be quality so I looked forward to receiving it. Then add the cost of the DJI Phantom2, H3-3D Gimbal, Go Pro HD Hero 4, super fast and large memory card to cope with 4K footage. It starts to add up at this point. The case was absolutely superb! This case is pretty large but that is the reassuring thing. I am happy to carry this around and throw it in the back of my car knowing that the Phantom 2, props attached, and all the bits including the 7" monitor are all snugly secured inside. You get the main case, the superb and solid foam insert and a small HPRC case which will hold up to 8 MicroSD cards. I've used this case on a few occasions now and love it. I feel secure in the knowledge that this expensive and somewhat fragile equipment (especially the props and gimbal), are being well looked after. I also like the fact that the lid will not close when knocked or blown by the wind which could result in a damaged quad or hurt fingers. 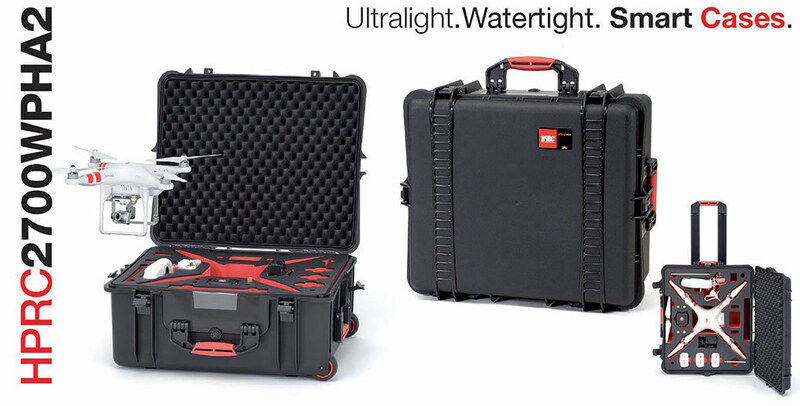 All in all, this case is excellent and highly recommended to carry and transport your DJI Phantom 2 / Phantom 2 Vision / Phantom 2 Vision+ and yes, I would have bought this case if I hadn’t been sent it already. If you know me, you will know that if I spend a lot of money on kit, I also make sure I get the best cases and bags to look after that kit.